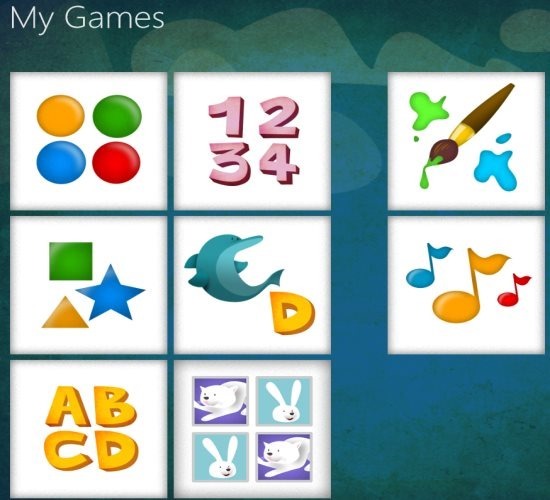 My Games is a free Windows 8 kids game app available under the ‘Games’ category of Windows 8 Store. Here, in this kids game Windows 8 app, you can find 8-in-1 game tool that include learning games such as learning shapes, the letters, numbers, matching of letters, matching of animals, matching of numbers, ABC of animals, and much more. This Windows 8 kids game app is a nice educational game app, designed especially for preschool kids that makes them learn and grow while having fun. My Colors: Here, you need to find the right color that a tiny rabbit is speaking. Each right-click on the right color will disappear the that circle. My Numbers: You need to count the number of animals given and click on the right number. Very beautifully designed. My Shapes: This section let the kids learn the name of different shapes. As, you click on any shape, it speaks up the name of that clicked shape. My ABC: This part lets you learn letters along with the names of animals starting with each letter. My Letters: Here, you need to listen and recognize the name correctly. As you click on a specific letter, it will speak up immediately. 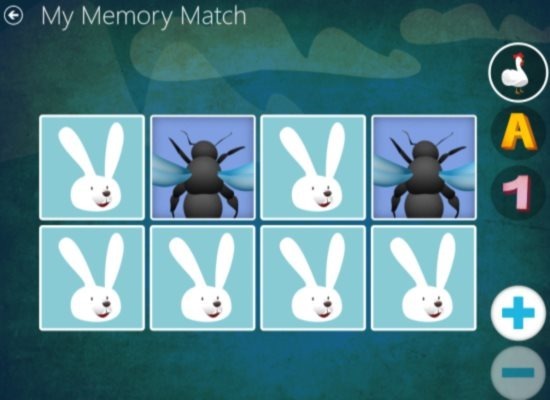 My Memory Match: It’s very interesting to play this kids game. Here, you need to click on a square tile and see which letter is it showing. Now, keep on clicking the other square tiles and match the ones that are same. Letters, numbers, and animals, all are available here to play matching making game. The interesting part is the sounds that play at the background. Kids can hear sounds of all the animals that are available here in this app. The graphics are so very beautiful. I am sure your kids are going to love this Windows 8 kids game app. Note: My Games app seems to be work-in-progress as the other two categories Music and Paint did not work. A message ‘Not Yet available’ displays as you try to open those categories. Similar apps: Paint4Kids, Jopii, Sticker Tales. Press ‘Win+Q’ to open the search box. Type the app name i.e My Games in the search box and press enter. Soon the app will be extracted from the store. Open it. Click on Install button to install now. You are done.. let the kids learn while having fun. In short, My Games is an excellent game app for Windows 8 that let you kids learn the very basics while having fun right on your PC. Go ahead and download My Games now.